San Amour is a real shooting star for breeding and his offspring are becoming more and more established on the international stage. West Side Story was part of the Swiss Team at the World Equestrian Games in Tryon/USA with Isabell Wettstein. Sinclair Jason/Christian Schumach/AUT, Sun Of May Life/Regina Isachkina/RUS and Sandro d‘Amour/Olga Safronova/BLR won and were placed up to the World Cup freestyle in 2018. 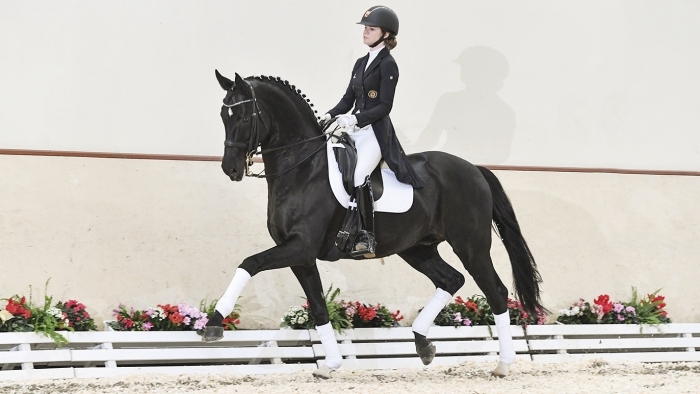 And then there is San Amour‘s showpiece daughter Saphira Royal/ Stefanie Wolf, who took second and third place in the Small Tour at the CHIO Aachen after winning bronze at the 2016 World Championships for young horses (7y) in 2016 and having won the German Championships every year between 2012 and 2015. St.Pr./El.St. Puppenfee, Oldenburg Reserve Champion Mare and ranked Ic at the European Championships in Brussels/BEL. San Amour is stationed at Deckstation Paul Schockemöhle in Mühlen.